Tekashi69‘s a wanted man for all the wrong reasons — there’s a warrant out for his arrest. The rapper is wanted in Houston for allegedly choking a 16-year-old kid at the Galleria Mall back on January 6 … this according to legal docs obtained by TMZ. In docs the alleged victim, Santiago Albarran, claims he ran into Tekashi and started recording him. Albarran then claims Tekashi turned around and began to yell at him to erase the video, and says Tekashi grabbed him by the neck as his bodyguards surrounded him in an intimidating way. Albarran says he erased the video so he wouldn’t get hurt again … but a video shot by someone else made its way onto social media anyway. The video shows Tekashi and Albarran in a scuffle and Tekashi grabbing his jacket, but hard to make out if he’s also grabbing his neck. Albarran says his family witnessed the incident and he reported it to cops who say they did document seeing scratch marks on Albarran’s neck. This is just the latest in Tekashi’s drama-filled life. As we first reported … someone in his crew was busted for firing a weapon inside the Barclays Center during an Adrien Broner boxing match. 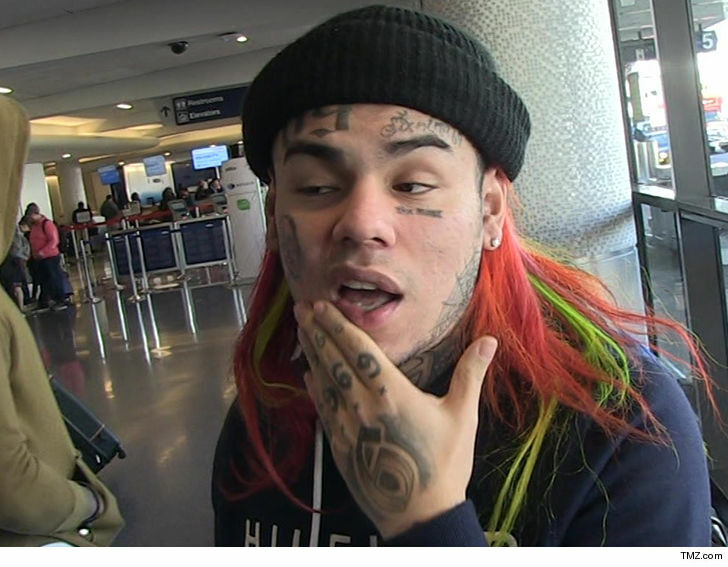 Tekashi also had a run-in with NYPD in February and got clowned for his brawl at LAX.